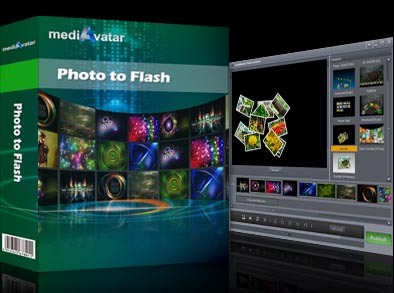 mediAvatar Photo to Flash is the best photo to flash slideshow creator which can create photo flash slideshows from lots of photos in jpg, jpeg, png, gif, bmp, tiff, xbm, xpm formats to SWF, XML and HTML output formats. To create a personalized photo flash, you can add background music, make a choice from many given flash templates, adjust the orientation and display sequence of the imported photos and etc. Features: 1. Create flash from multiple image formats, including jpg, jpeg, png, gif, bmp, tiff, xbm and xpm. 2. Add background music from various audio formats, like aac, aif, aiff, ac3, ape, au, flac, mpa, mp2, mp3, ogg, ra, wav, wma, m4a to enrich the output effect of flash. 3. Multiple templates including 3D templates are available to help you design the flash. 4.Adjust the orientation of the imported photo collections; fine-tune the display sequence of images by drag-and-drop. 5.Personalize the background music by setting the play order of background music, clip background music to retain the favorite segment, add fade-in and fade-out effects, you can also set the loop mode to play background music automatically. 6.Generate SWF file or publish as HTML flash gallery directly. 7.Support XML as output format and enable you to update images in the flash gallery without the program. 8. Available in English, German, Spanish, French, Italian. Ideal DVD to iPad converter is an efficient and simple iPad dvd converter. It can rip any copy protected DVD movies or avi/mp4/wmv/flv to iPad format with perfect quality. Optimized for double cores processor, ripping speed is much faster. Any Video Converter Ultimate is an All-in-One DVD ripper and video converter which helps you rip DVD and convert video to MP4, AVI, for iPod, iPhone, mobile phones. It also features video recording functions. Ultra RM Converter is a tool to help you convert RealMedia(*.RM,*.RMVB) files to AVI, DivX, Xvid, MPEG1, MPEG2, VCD, SVCD, DVD, WMV formats. With the fast and powerful RM/RMVB decoder inside, Ultra RM Converter can support almost all RM/RMVB files. MVS Player is a DivX multi-video player with supports many file formats. With MVS Player You can visualize until 12 videos simultaneously on the screen. Best performance in video accessing only 15ms for 1.5GB video size. This site does not contain serial number, crack, keygen mediAvatar Photo to Flash serial number : serial number is the simplest type of crack. A serial number(cdkey,product key,etc) is register the program as you may already know. a crack or keygen may contain harmful software. If you cannot find the exact version you want, just give it a try. for more information read .nfo/.txt/.diz file include in zipped file.